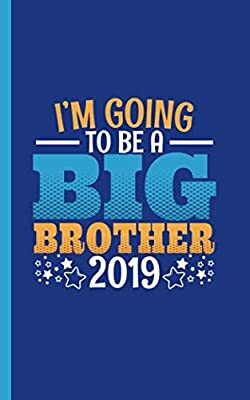 I'm Going to Be a Big Brother new baby gift for toddler or older boy child to welcome the new baby. Motivational! Inspirational! Use for baby gender reveal parties, baby showers, or just a simple gift to let the older sibling boy know he's still loved and not forgotten. Binding: Durable trade paperback binding (perfect bound), works well for one subject school assignment, taking notes, journaling, or a Do-It-Yourself (DIY) diary planner for kid boys. Bound similar to books found in your local library. Works best for child promoted to big brother, sibling son idea to help with pregnancy announcement or baby shower surprise. Encourage your older son to record his experiences with the new baby and participate in the fun! Perfect for a Christmas stocking stuffer or Easter basket filler for new sibling..